It was a golden moment, lifting the snug cardboard top off the big long box that held so much wonder and suspense in the days before Christmas. Under a clear plastic window, Styrofoam cradled a Tasco 3½ inch reflector. My first glimpses of shimmering jewel-like clusters around the Southern Cross were revelations that sparked a lifelong interest. That was 1980, proper refractors were way out of budget and out of reach, but over countless, cool carefree Australian backyard nights, in my element, in the days when streetlights extinguished at11pm, I didn’t care. Meade 8-inch f5.6 SCT / ETX 90 / Celestron 9.25 inch f10 SCT / Vixen 120 NA Achro / Skywatcher Equinox 120 Apo / Skywatcher 6-inch f5 Achro. I’m also into nightscape photography at dark-sky sites, which typically involves flying from my light polluted home. I’ve developed a streamlined kit that fits perfectly into carry-on luggage - there’s even room for a couple of spare pairs of underpants. I’ve been searching for a travel ‘scope to go with it - an affordable, four-inch aperture refractor with decent glass, compact enough to take on board a plane. I spotted the Bresser AR 102 SX amid ebullient German sales blurb that made much of its ‘amazing’ little-more-than 2.5 kilo featherweight build. I’ve never bought brand-new – always ‘open box’ or pre-owned. The Tasco 3 ½ inch was new – but Dad shelled out for that one. Now I’m a father. On occasion this apparently unstable and ephemeral world scares the hell out of me. I try to be nice to people. At just £222.50 including delivery - I reckoned I owed it to myself. Secured in double-layered cardboard, another Styrofoam cradle, and a familiar, nostalgic tinge of excitement. The ‘box opening’ became an event as I shared the unveiling with fellow Astro-nerd Rory, who is more Astrophotographer than observer. Everything looked neat and securely packed. After a frantic battle with endless tabs of hidden sellotape, the instrument was out for handling. First reaction – Wow this tube is short. Wrestling the lens cap off was a mission (more on that later), but when it was finally uncorked, humms of approval greeted first glimpses of a clean, greenish tinted objective which suggested decent coatings. I’ve seen robust on-line discussion about whether the objective is indeed ED glass. The retailer certainly sold it to me as an ED scope – but there is no mention of it on the tube livery, or in any of the non-specific manual / warranty paperwork tucked in the box. I’ve got no idea exactly what type of glass it is … but I’m an uncomplicated amateur observer. As long as the views are good and the optics collimated, I’m happy. The oversized ‘hex’ focuser was a nice surprise – rotatable, with three sturdy securing screws and the widest ‘rack’ and focusing pinion I’ve ever seen. In this case 'hex' means the inner draw-tube is hexagonal, rather than cylindrical. I'm assuming one has to be careful to store it with the focuser fully racked in, to prevent dust or dirt seeping into the tiny gaps. The king size brushed aluminium focusing knobs looked and felt solid, as did the focusing lock. Astrophotographer Rory was smitten – pointing out the obvious features that suggested this was a scope aimed more at snappers than observers. Even the Vixen / Synta dovetail is designed like a telephoto-lens foot. There’s a steel strip that makes the dovetail that little bit thicker – and protects the paintwork underneath from holding-screw marks. Nice touch. Now, to the so-called ‘accessories’ – which also suggested this was a package for photographers – mainly because photographers wouldn’t bother to use them. The supplied chrome-painted plastic diagonal and 26mm Plossl were flimsy, even for a beginner. For the price I wouldn’t expect anything more. I do recall a useful post that advised saving such cheaper items for shared public viewing sessions – but I wouldn’t bother. The flexible and brittle-looking plastic finder and mounted shoe also seemed barely fit for purpose. BUT again … what can one expect for an alleged ED refractor for a couple of hundred quid? I couldn’t wait to find out. The sky was clear, but at a Northern Hemisphere latitude and time of year when summer nights don’t really get dark – just a deep turquoise-blue. I love my big city suburban home – but the light pollution is significant. My permanent backyard mount is mainly for lunar and planetary observing, but on went the spanking new Bresser for an all-round test. The first ordeal was removing the protective cap from the fixed dew shield extending from the objective lens. No buttery-smooth, metallic retractable dew shields here folks. Removing that dust cap from a vinyl-lined rim is like extracting a compliment out of the mother-in-law. Tough. One starts delicately, gradually increasing applied force until in my case – prizing away with an oversized screwdriver - the cap shot away with a rifle-like crack over the neighbors’ fence. Front cap removed, trying to align that flexi-plasticky-finder was the next mission. The flimsy finder-tube actually bends - and the plastic holding screws popped out of their housing with another crack when tightened past a point that seems to defy alignment with the main scope. After some frustration I was able to align on one of the crosshairs at a recognizable point. That would have to do. Bright planets and stars generally bring out the worst in fast achromatic refractors – the dreaded violet-blue halos and flares of Chromatic Aberration. I decided to subject the alleged ED glass to the sternest test. Under a relatively bright, semi-moonlit, light polluted sky, I didn’t have much choice. Cooling the stubby tube to ambient temperature was as quick and easy as expected. Set with objective pointing down, and a (dust-free) nylon sock over the open focuser end pointing skywards, warmer air could escape. I gave it 45 minutes – I later found out that around 30 minutes is good enough. Jupiter was past its best, approaching the murk of the South Eastern horizon, but still bright, winking in less than steady air. I put a proper diagonal in the back and began with an ultra wide angle 13mm eyepiece. The semi ‘aligned’ finder worked OK, and the wide-field of the f4.5 objective makes bright objects pretty easy to find - even with higher magnifications. I centred the Jovian blob in the field of view, twisted the smooth oversized focuser wheels, and was amazed. Yes, there was a violet halo that sometimes extended flare-like more than a planet-diameter beyond the disc … but the equatorial belts were there, the major moons were clear and now and then, intriguing mid-hemispheric detail could be glimpsed through a good quality 5mm eyepiece. The wide field view was so pleasing I forgot about the CA. I tried a Baader fringe-killer filter that I bought for my Vixen 120 NA long ago, but still preferred the more natural-looking CA-drenched view. Given the low altitude and somewhat unsteady twilight sky – I was really impressed. Yes, the sharpness and detail were nowhere near what I’ve seen in the 120 Equinox, but I had to keep reminding myself this was a relatively cheap, 4-inch, wide-field 4.5 scope. Overall the contrast was pretty good. The next target was another traditional no-go for a short refractor – a quarter moon. Once again, the violet-flare of CA was evident, but once again, after a few seconds at the eyepiece, I forgot all about it. Tiny sunlit peaks over black shadow-lands were obvious along the terminator in a 5mm eyepiece. The relatively sharp views from this intriguing, ultra-fast f4.5 compelled me on my rebellious ways to yet more unsuitably bright targets. I swung (actually the tube is so short it defies swinging) … tilted … the stubby ‘scope in the direction of Arcturus. Wow. Again, I’m not sure what’s in that glass objective – but whatever it is – to my eyes - it delivers a kind of metallic sparkle on stellar targets, like tin baubles on a Christmas tree. The burnt-orange hue was wonderful to behold – and no CA that I could see. But the sky wasn’t truly dark, perhaps the late summer twilight was masking false colour. Vega was a brilliant white-blue … a thin violet edge evident … but not enough to spoil the view. Racking in and out of focus showed a neat circular blob – although crisp ‘Airy dics’ eluded me – it was enough to prove to me the ‘scope was relatively well collimated and free of any ‘pinched’ optics. I moved on to Albireo – the impressive colors of the main yellowy star and its tiny sapphire-like companion sparkled through. I slotted an ultra-wide 21mm eyepiece into the diagonal. The added height meant I couldn’t comfortably look into it without bumping into that *&%! plastic finder. Here’s where the rotatable focuser was handy. With a heavy eyepiece it can be a real pain to keep shifting and re-clamping a diagonal holding screw. In this case – I found it much easier to move the entire focuser around. The only slightly disconcerting factor was a grinding-sand like sound when the holding screws were tightened in a new place around the ‘hex’ tube. Perhaps one isn’t supposed to do this. Anyhow, back to the wide field view. Even in light polluted skies, dim star fields around Cygnus were evident, but there was a tiny bit of curvature evident around the extreme edge. A 30mm eyepiece extended this curvature more noticeably – to an extent that began to spoil the vista. I’m assuming there’s a field flattener for this ‘scope, but as a visual observer I’m not that bothered. Swapping back to a 13 mm eliminated the problem – and the field of view was flat to the edge. A final look through a 9mm at M57 ended a memorable first session with the 102XS. A vaguely greenish ovoid smoke ring glowed dimly among pinpricks of faint yet well-resolved stars. Lovely. I was impressed and pretty happy with my impulse purchase. It was time to plan a trip to dark skies to test this super-short, super-fast ‘scope on the wide field views it was designed for. Packing the AR102XS for a family holiday was a breeze. The scope, my own quality diagonal and eyepieces, and some separate camera gear all fitted neatly into a medium-sized backpack. As we were travelling by car I could take a solid Porta-mount style Alt-Az set up with a robust tripod. The weather in southern France was pretty good – the two nights I ventured into the fields were very different; one warm and dry with a little hazy high cloud, the next cold and dewy. The moon was approaching first quarter phase – which meant I had to wait 'till midnight for the interfering glow to slip behind the horizon. I left the ‘scope outside for 30 minutes – the views after this time were steady – suggesting the short cool-down time was sufficient. After another struggle aligning that flimsy finderscope – and searching for plastic holding screws that kept popping out into long grass – I vowed to replace the finder before the next observing trip. But the main attraction of this refractor – the (apparently) ED f4.5 objective – soon shone through, and the finder-fight was forgotten. Catching M13 before it drifted too far West, the view through a wide-field 13mm eyepiece was beautiful, showing a tight, clearly stellar ball with a smatter of outer pin-points clearly resolved. M27 was crisp. The unmistakable hourglass peeping out amid surrounding stars, I thought I might have detected a vague green-red tinge, but I’m never convinced about ‘seeing’ colour in such objects, and suspect that it might have been wishful thinking. A huge advantage to such fast optics was quickly apparent. Operating on a non-driven Alt-Az mount, the combination of a wide-field ‘scope and eyepieces meant targets stayed in the field of view longer. M33 was easy to find. Alternating between wide angle 13 and 9mm eyepieces, averted vision showed glowing clumps beyond the main hub. No obvious spiral structure – but knowing what it looks like in long exposure photos - it’s tempting to imagine one has glimpsed such things. Seeing objects in wider fields-of-view was also something special – as was the experience of relatively large objects – such as Andromeda. Just stunning. In the wide-angle 13mm, the main companion was obvious, and detail could be teased out with averted viewing. I’m not claiming to have seen spiral arms – but it was far more than just a big elliptical glow. Very different from any view I’ve seen in other, larger aperture ‘scopes. It was hard to stop gazing and move on … but when I got to the Pleiades rising in the East, I was glad it did. Wide-field star clusters like these must be the reason for this ‘scopes’ existence – the thrill takes one back to that first time at the eyepiece. Under genuinely dark rural skies (I was momentary spooked by a deer) I’m pretty sure I glimpsed faint blue filaments of gas-glow around the brighter stars. The Hyades were equally amazing – Aldebaran a glittering, crimson jewel. The slight curvature around the edge of field I’d noted in the 21mm ultra-wide field eyepiece seemed less bothersome under a darker sky, probably down to the enhanced, immersive spectacle before me. I tried to count individual stars, but gave up when I got past 60. Free-styling across the summer Milky Way without GoTo - or kneeling in the damp grass before that flimsy finder - was a delight. Even something vaguely interesting like the ‘Coathanger’ asterism in took on a new character through the 102SX. The tell-tale pattern filled the field of view, along with many other faint, yet sharp pinpoints of light. It was on the second, cooler, dewy night that another, eminently treatable shortcoming of the ‘scope in its original form became apparent. The fixed lens hood is too short for long viewing sessions when the dew sets in. There was no power source for a hairdryer handy in the remote farm paddock, but it was half past four, and I was expected to perform the usual family duties with those who had drifted into dreams under stuffed quilts at 9pm. No matter – I’d had my kicks. Those scintillating star-clusters were burning in my mind. For me, the 102SX is a solid, wide/rich-field travel scope. I’ll pimp up the finder-scope and dew shield, making this one a keeper. Nice review which got me thinking. I have two trips next year and I was thinking which scope to take. This one is something I can take without worrying too much. Now on the list of possible scopes. "Removing that dust cap from a vinyl-lined rim is like extracting a compliment out of the mother-in-law. Tough." I have the scope and got it for its size and portability, really can't disagree with the finder have replaced it with a right angle finder that I had from my previous scope, though am still trying to get the aperture cover off to use it ! I've also had my eye on an AT 72mm f/6, which is also small, probably close to a true apochromat, but slower. And less aperture. My guess is the Bresser, besides having a wider fov may be brighter and reach deaper on Milky Way etc. ? Tip: "...and searching for plastic holding screws that kept popping out into long grass..." When I have my act together I put a tarp down under my viewing area, and this is a major reason why. Also for insects lurking under foot. Nice review. Thanks. I have had this telescope since last June as my grab-and-go and travel scope and have only had good experiences. I use it mostly for visual variable star observing. CA is present only around the brightest of stars but that does not bother me at all. Accessories (finder, diagonal, eyepiece) are a waste of money and CO2 emissions. Should not be included at all. As you say, buyers should know they must buy quality stuff if they do not yet have them. I use it mounted on a Vixen APP TL 130 tripod. Excellent combination for a visual G&G and travel scope. All in all an excellent telescope for a real low price. That is really a good thread, with lots of info! I can warmly recommend this telescope as an excellent G&G - Travelscope, lightweight and small, yet very capable instrument. As I wrote above, I suggest mounting it on a Vixen APP TL 130 tripod, using a Vixen Porta II mount. The combo is very stable and extremely lightweight. 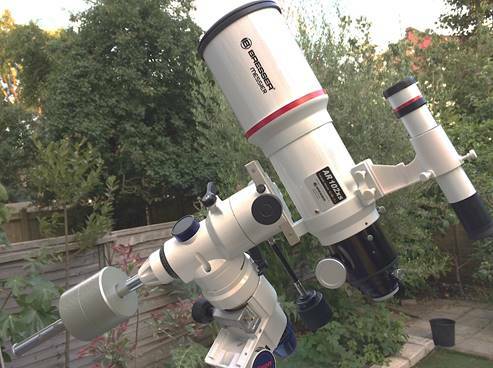 I also use an Omegon 2" diagonal and (mainly) an Explorer Scientific 82 degree 18 mm eyepiece, which gives 3.2 degrees field at 25.6 X. Alternatively I also use an ES 82 deg 8.8 mm eyepiece, that gives 1.5 degrees field at 52X. I had a chance to play a bit with this scope thanks to a friend. Overall I agree with the review, albeit the main CA I've found in this case is a beautiful "binocular-alike" yellow rim around the bright half of the Moon which always remind me the saints' headlights depicted by the medieval master painter Beato Angelico. However the violet was missing, adsorbed by the yellow. Commonly, inward out-focus does bring forth violet as well as backward out-focus does bring forth yellow, hence under 2mm exit pupil the fine focuser option is indeed advisable. The accessories are plastic toys, and switching toward a better 2inch mirror diagonal does improve the view ALOT, because whereas Trapezium looks bloated with TV and ES both 11mm riding on the shipped diagonal, it is plainly resolved in its four stars when both the EPs rides a WO 2inch DuraBright; and the yellow color of the bright side of the Moon is also lesser scattered (urban centre, city lighs everywhere, I don't know at dark site). Carbon star R Lep (Hind's Crimson Star) was a pin-point red dot as well as Betelgeuse was dark orange; CA began to appear with high magnitude and brighter spectral classes A to O (Sirius, Rigel and so on) but this was irrelevant for the wondrous sight of M42/43 nebulosity (without narrowband UHC; with UHC it was simply magnificent for a LP site). The "birdy" shape was very apparent. One could be expecting "warp drive" effect upon buildings antennas due to the short focal length, instead also in daylight time the field distortion is not bad at all and the outfocus toward the field stop is tolerable - yet for whom are familiar with middle-class binoculars. The weird thing is a single instruction paper leaf stating that: "when using an EP in the telescope, one of the extension tubes must be mounted. For most eyepieces, the longer extension tube should be used"; well - on the contrary - none of the EP used (2 and 1.1/4 inches) did achieve focus in this manner, neither with the diagonal in place: to achieve focus no extension tube must be used. Nor is achieved the straight-thru focus; there is no way to achieve straight-thru focus with or without tubes either: they are still short altogether. With the diagonal and without extension tubes, the scope did get focus from 34 to 9mm EPs (surely also with EPs > 34mm and < 9mm, but not tested) either of 2 or 1.1/4 inches. Without the diagonal those EPs didn't get focus. The scope is very portable and fits also some eyepieces bags. The scope was mounted upon an AZ3 and albeit stable and well-balanceable even with 2inch accessories, a better mount is advisable. This is a lovely and performant G&G scope. It doesn't look like this is available in the US, which is too bad because it looks like a great scope. You can always import it from Europe. Your price would be net of VAT by the way. Shipping should not be prohibitive. I've changed viewfinder and star diagonal to something more "serious". The supplied ones are absolutely crap,i had a broken screw and damaged crosshair in my viewfinder (i used a hair from my head to fix it!!!!!). Review is absolutely accurate about telescope performance. My only disagrement is the use of 30mm eyepiece. I think it's useless in such focal ratio, because it overcome the minimum useful magnification of the telescope. I think 20-25mm eyepiece is the minimum. For what it is worth, and not to hijack the thread, a couple of us CNers just received a SkyWatcher GTI mount and scope from the UK within the past 10 days. Shipping was annoying but not prohibitive, and what choice is there when the kit isn’t sold in the colonies? Nice review. I’ll want to se results against my new SW 102Mak and budget ES 90 that arrived on Monday and will be hosting a Lunt wedge for solar (been on a bit of a tear lately). I know that this is an old thread and i don't blame you if you don't respond, but how do you think this would stack up against a Celestron C6? Both look very portable so I'm talking about views here. I am most interested in DSOs and lunar visual. I am about to buy my first telescope, its between this and a C6. I have the Bresser Messier AR102XS and so not think it qualifies as a lunar telescope. You can of course look at the Moon with it, but with a focal length of 460 mm it is difficult to get high powers with it. Also CA will be noticeable at high powers and may bother you. For me, the AR102XS is an excellent grab and go and travel scope very well suited for low power, wide field observation. Good luck! As long as for "DSOs" you do not mean some open clusters, Veil nebula and large HII regions, I will go with the C6. These two scopes are very different aimed scopes. For planets, Moon, globular cluster, PNs, galaxies and double stars, the C6 wins: for aperture and focal length either. For low power widefield pan scanning and sky framing, the AR102s is better suited. Note: the term "portability" is a bit ambiguos: often is implied few steps walkaway grab&go rig (OTA + mount), but more often is intended bare backpacking trekking, bicycle/motorcycle riding and bus/rail/air trips; hence the C6 + mount is those cases is a bit of an annoyance to deal with than the AR102s. Nice review indeed. I'm thinking of purchasing one now. so to be clear it claims ED glass (FPL-51/53?) is this only 1 of the lenses that make the doublet?. So in effect is it a Petzval scope?. I think it is only AR127 and AR152 in Bresser line that use Petzval design. I have got AR102S and it is certainly not a Petzval design. AFAIK AR102XS is basically a shortened AR102S and in order to reduce the chromatic abberation they used ED glass on one of the doublet lenses. It is definitely not a ED scope though. Right so a semi-apo it is then. I'm just catching up with threads/posts on this scope. I'm interested for sure as part corrected wide field sounds like a nice step up from Skywatcher's ST80/120. Hmm...not sure if I would call it a semi-APO. I had a chance to look through it once and CA seems to be pretty close to my AR102S. That means it is well pronounced on bright stars. Surprisingly, my experience is that ETX80 f/5 shows less CA - maybe due to the cemented objective? I personally consider AR102XS to be an ordinary (although very short) achromat. The ED glass just brings the CA close to the usual low f ratio achromats. If they used the same glass as on AR102S the CA would be so bad that nobody would probably buy that scope. That's all the ED label means in this case in my opinion. Hi i had the same questions and i send an email to BRESSER. Here is their answer. Hope it helps! thank you for your interest in a BRESSER telescope. - What type of ED glass do you use? What exact ED glass it is is a business secret, I ask for your understanding. But of course, at this price range it is logical that it is a very cheap ED glass. - How severe chromatic aberration i must expect? It is like a normal achromatic refractor around F/7. - Concerning ED glass, can you classified it as a semi apo telescope? No! We classify it clearly only as achromatic refractor! We use ED glass at this telescope only because at F/4.5 you cannot really use normal glass. - Is it suitable for astrophotography and EAA? This telescope is made for wide-field observing. For example the North-America nebulae is a very nice object to observe at this telescope. It is also a very nice telescope for travelling. Of course, you can also use it for imaging, but you will get some color at bright stars. But this telescope is NOT a apo-chromatic flat-field astrograph!